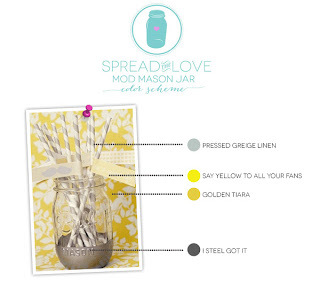 Procraftination: Spread The Love Campaign & my blog crush! Spread The Love Campaign & my blog crush! Hey there. Have you heard about Clear & Simple Stamps' Spread The Love Campaign over at Amber's blog? The concept of the campaign is to create a card to "spread the love"...post it...then reveal the identity of your blog crush. And tell everyone why you're inspired by their blog. How can you not love something so positive and fun? Amber gave us a choice of 6 color palettes to chose from. 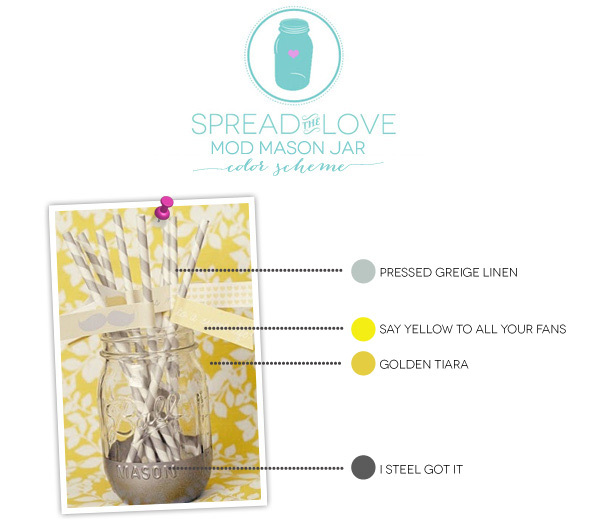 I chose the Mod Mason Jar color scheme. I was inspired to make the card below, using some SU cardstock, MME patterned papers, some PTI dies and SU silver embossing powder. Oh, and a piece of SU baker's twine, too. I don't own any Clear & Simple Stamps products. I'll have to work on that. Soon. But, fortunately Amber invites everyone to play along, with any products. Oh, and there will be prizes. Did I forget to mention that? My blog crush is Beachorado, which is Wida Miller's blog. Wida is so innovative, so talented and so humble. And I can't forget sweet and funny! Wida has been blogging for a relatively short time, but you'd never know it. Besides her fresh approach to paper crafting and her many accomplishments, she's created regular features on her blog that I've seen no where else. Diagnosis Design and CASADIA are brilliant ideas, and so well executed. Truly, you have to check them out. You can follow the link above to her blog, then just look for the tabs for the 2 features I mentioned. I could go on and on, but instead, why don't you visit her blog...you'll see what I mean. Thanks for taking a look today. I love visitors! I am honored, humbled and happy by this post Susie. I try to make and write interesting posts and sometimes you wonder if anyone notices. Today I feel like I made a difference to somebody. It was also my last day of work. I had so many people say how much they appreciated the care I gave and then to come home to this, well today is a good day. Your card is really gorgeous. Wonderful design work. Your card is beautiful Susie and Wida is such an amazingly talented lady, she is an inspiration to us all, as are you! love this color combo too and you used it brilliantly. I really like the use of the grey frame. Absolutely gorgeous! LOVE the grey and yellow on this and that floral DP is beautiful!!! Beautiful card and looks very Wida-ish! Susie, this is beautiful! I agree with you, Wida is something special! I came over from BECHORADO...Great card and I crush on WIDA too! Really beautiful card, especially with the yellow/white/gray combo! I came from Wida's blog too ... she's a special one, isn't she?